First you’re going to remove any surface dirt from your floor. Vacuum, dry mop or sweep to remove any loose dirt or grit. The best method is to vacuum with a soft brush attachment. 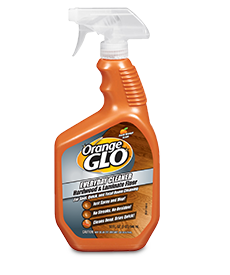 If you use your Orange Glo™ mop, don’t forget to remove any loose dirt after dry mopping by rinsing with water and wringing out the mop pad. You’re going to use it in Step 3 and want it be free of grit. *Be sure to test in an inconspicuous area of the floor. For detailed information, please see the instructions on the back of the package. Frequency of use: Use Daily/Anytime to remove dirt and grime, and to keep your wood floors looking natural and clean. Spray Everyday Cleaner directly onto a 4'x4' area of the floor. For stubborn spots, spray directly onto soiled area. Finally, make sure your Orange Glo™ cleaning pad is damp and well wrung-out. 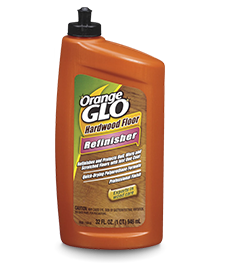 Following the grain of the wood, use your Orange Glo™ mop to thoroughly mop the floor surface using long even strokes. Rinse the mop if it becomes soiled during application. These three easy steps will leave behind a beautiful clean floor. Finish one area before moving on to the next 4’ x 4’ area of floor.